If you’re thinking about chopping down a tree, then there are some important things to think about. Firstly, how tall is the tree? The larger it is, the harder and more dangerous it will be to remove. Meanwhile, trees close to the house and those in difficult to reach places will increase the risks of something going wrong. You should consider the effects on house insurance if you try to fell the tree yourself and it causes damage to your property too. It’s also important to assess whether you have the skills, experience and tools to do the job properly. Though tree felling can be something you can do yourself, for anything more than a small tree, it’s often best to call in professional tree surgeons. This is particularly important if you want a tree reduced in size but not removed altogether. Experts will be able to prune trees properly so they’re ongoing health is preserved. 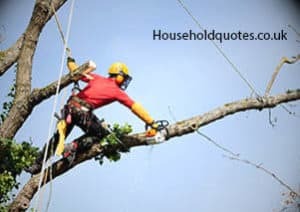 There are various factors which influence the cost of tree removal and pruning, including both the height of the tree and the variety. Some species are simply easier to handle than others, and this is reflected in the price. Overhanging branches also affect pricing because more care has to be taken when they’re removed. And, when such branches are across public spaces and will need a road or footpath to be temporarily closed, for example, it quickly becomes very expensive. Finally, removal of waste is also likely to push tree felling costs up. Though you might expect tree surgeons to automatically chip the branches and trunk, many companies will charge more for this. However, you can sometimes negotiate a lower price if you’re happy to take them to your local dump yourself or even chop them up for firewood. The tree felling sector is notorious for overinflated quotes, so make sure you do your homework and get a least three quotes, if not more. It’s also essential to ask the right questions so you’re not left upset and feeling ripped off. For example, will contractors take the felled tree away? Will they grind up the stump or leave it untouched? If there’s poor access, can you get a reduced cost if you clear a route; taking down fence panels, for example? Due to the wide variation often seen in tree surgeon prices, it’s important to ask as many questions as possible and negotiate instead of agreeing on the first estimate. Depending on your circumstances, the cost of your project could range from a few hundred pounds to several thousand. Due to the potentially large expense of such a job, it’s a good idea to research local tree felling companies properly and ensure you get quotes from legitimate companies. Local nurseries and horticultural colleges can also be a good place to ask for advice. Once quotes have been gathered, you should not only compare them against one another, but with national averages too. The two following examples assume that all waste is removed and the stump is ground down. Example 1 – A small multi-stemmed birch tree needs to be completely removed. These trees are one of the simpler varieties to prune, and the job’s around half a day’s work for a two-man team. Outside London, prices are likely to vary between £300 and £500. For those living in the capital and immediate areas, prices could be as high as £750. Example 2 – A large oak tree has grown to over 100 feet tall needs felling. It’s also growing in a site with poor access. Removal of such a vast tree needs a team of five, including two professional tree surgeons. There are several tonnes of waste material to remove too. In London, competitive quotes could be between £3,000 and £4,250, whilst they’ll be between £2,500 and £3,500 across the rest of the country. If you want to fell a small tree, it’s relatively easy to do so and the costs can be negligible, especially if you already own the right equipment. However, it’s extremely important to honestly assess your experience and skills, and if the job seems could create a dangerous situation, it’s best to turn to tradesman sites, such as Quotatis, for professional help.